Since anaerobic (without air) bacteria are the ultimate culprits in bad breath, the perfect product must kill them almost instantly. This is where specific ACTIVE chlorine dioxide (ClO2) products come in. These are the products of choice because they have a 100% kill rate in minutes. But also important is that they destroy bacteria in a way that prevents these bacteria from creating resistance to them. That way they are always just as effective each time they are used. The perfect mouthrinse must eliminate odor-causing molecules almost instantly. Rinsing with an ACTIVE chlorine dioxide (ClO2) product distributes the solutions throughout the mouth and results in near instant neutralization of odor molecules. 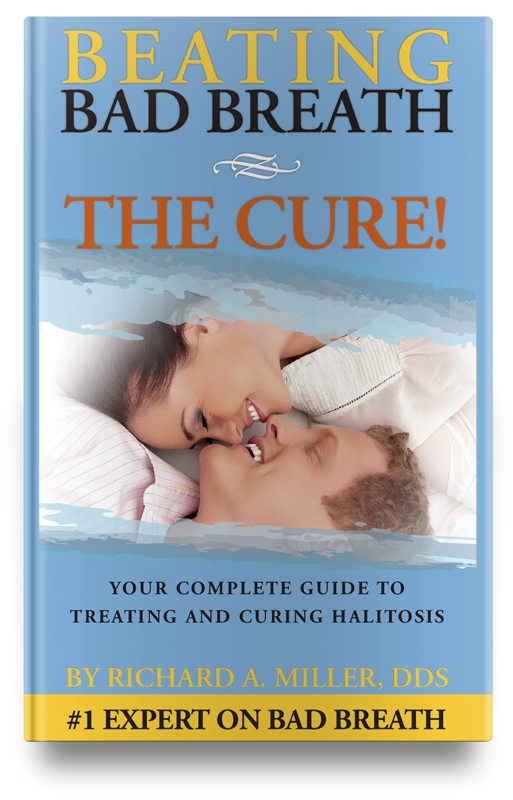 The same bacteria that cause halitosis also cause gum disease. An ideal mouthrinse and toothpaste must kill these bacteria and contribute to healthy gums. The ideal product would be mixed as needed allowing each person to control the strength. Why? You want to vary the strength for the severity of bad breath; for tongue cleaning you need another strength; and for use in the oral irrigator you want a different strength. This property – mixing when needed and varying strength – allows you to customize your treatment and results and gives YOU total control over the treatment. 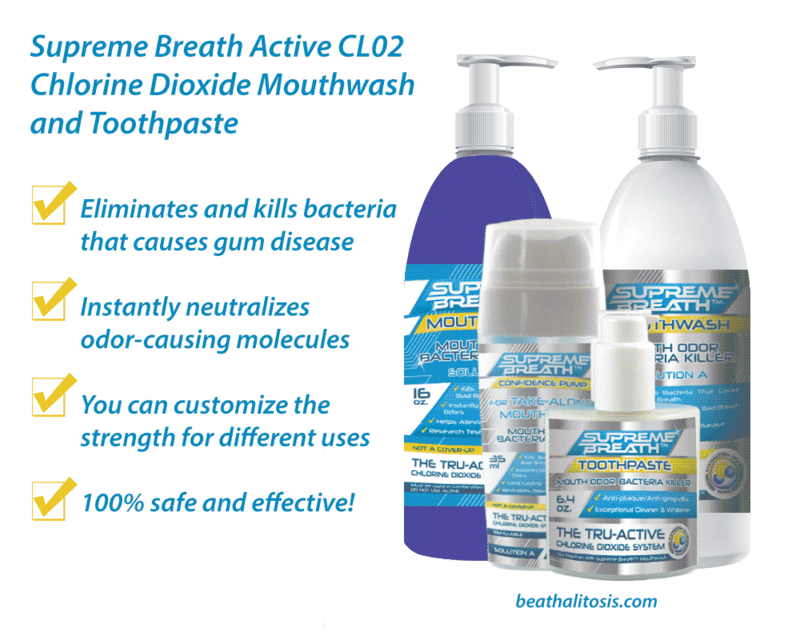 Supreme Breath Tru-ACTIVE ClO2 mouthrinse and toothpaste not only kill the bacteria that cause halitosis and gum disease and kill the odors of bad breath, but are non-toxic. They are bio-compatible with oral tissues so I also recommend gargling with it to kill throat bacteria and kill the odor at the back of the tongue where the tissue is much softer. Gargling is also especially helpful for sinus drainage. Tru-ACTIVE ClO2 products do not cause dry mouth nor create any of the other problems that other products do. The fact is that after using and testing all the available products for over 20 years, both over-the-counter, on the internet, and the existing “chlorine dioxide” products, I had become discouraged. I had never found a product that met all the above requirements. Until now. The result is the SUPREME BREATH™ Tru-ACTIVE Mouthwash and Toothpaste products – the only products that meet all these criteria. 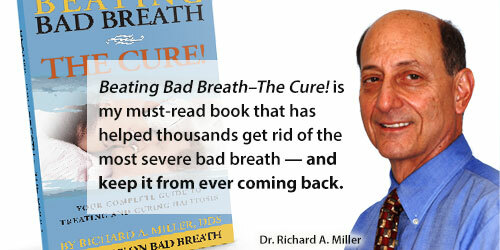 To find out how to use them for maximum effectiveness, refer to my Beating Bad Breath Protocol.